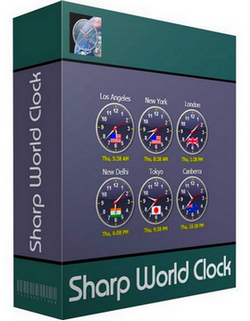 Sharp World Clock — flexible, accurate, customizable,sophisticated desktop world time clock / alarm clock / time zone converter for your Windows desktop. Look no further, you have found it! 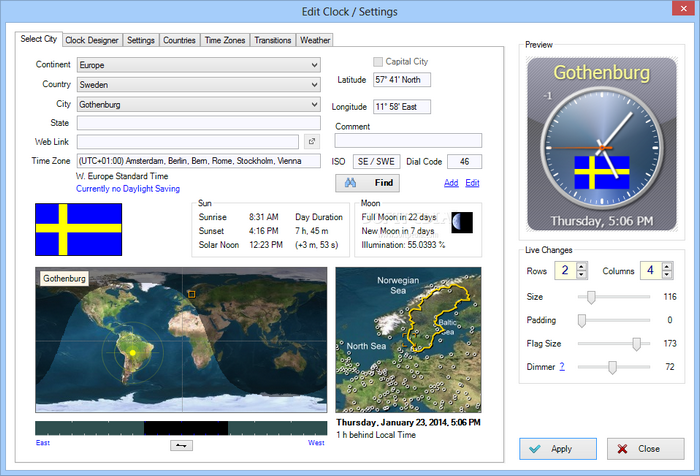 Sharp World Clock is a feature-packed, state-of-the-art time zone clock and alarm clock software, using the most recent Microsoft programming technology (.Net / WPF). It is intuitively, enjoyably and easy to use. Over five years of development have gone into this program. Download the free trial version right now and join thousands of satisfied users all over the world. Integrated Alarm Center with unlimited alarms (local time zone or any other time zone (once, hourly, weekly, monthly, annualy, periodic timers plus count-down timers), silent or with sound in wav, mp3, wma or mid format; even spoken messages! Temporarily adjust the time of all clocks within a ± 12 hours time span (5 minute grid) with a trackbar, so you can instantly and intuitively see the time in other cities for any selected time! Easy and intuitively to use and to configure: you'll probably never need the help files. No subscription fees and free updates for life!